I am not going to lie, February is one tough cookie of a month. Winter seems to have already gone on forever with seemingly no end in sight, and frankly March is just going to be more of the same. I go to bed chilly, wake up chilly, the sun is bright and cold, I've ceased to care that I look like a molten chocolate cake on legs in my coat and hat as long as I am warmish, and then there is the nagging thought that snow can blast in on us at anytime. Woof. You have to be prepared for anything in February, and you have to be prepared to tough it out until April. Maybe May. My coping skills include a deliciously easy shepherds pie and a hearty cranberry-carrot cake. Anything that involves turning on the oven for a while. 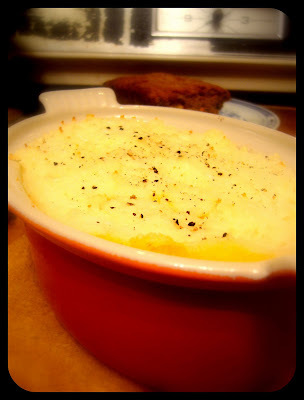 Shepherd's pie made in the perfect pot. It makes just enough for dinner and lunch the next day. 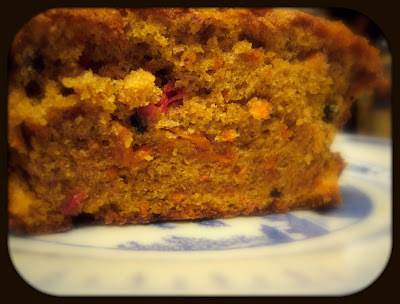 Cranberry-carrot cake I usually make in a loaf pan unless I need it for a birthday cake. Or sometimes I make muffins. This is the only "cake" recipe I have that can be used as a loaf, round, or muffin without adjustment. Even if you think you don't like carrot cake, you would like this cake. I cannot wait until the salad days of summer. Although probably then I will moan about how it is too hot to can. I got married on April 14th and we hd a snowstorm!